"There is no such thing as inclement weather, only inappropriate clothing." — Ben Zander, Boston Philharmonic Orchestra Conductor, on Sixty Minutes. Summer camps are being planned for 2007. All adult members are invited to be part of the leadership team. Youth members or their parents who are interested should send a note by e-mail if you would like to receive personal notification about the summer camp program. The Cub Camp is being planned for two sessions during the weeks of July 8 to 13 and July 15 to 20, 2007. Do Your Best to be there — pencil it in your calendar now. Contact Sarah Kassa for more information about the summer Cub Camps. The Scout Camp is being planned for the week of July 21 to 27, 2007. Be Prepared — plan ahead for summer camp. Note that date in your calendar. Contact Ted Claxton for more information about the summer Scout Camp. Please review the Central Ontario Camping Rules and Procedures (62 Kb PDF) document before you go camping. Here is an aerial view of Camp Everton. 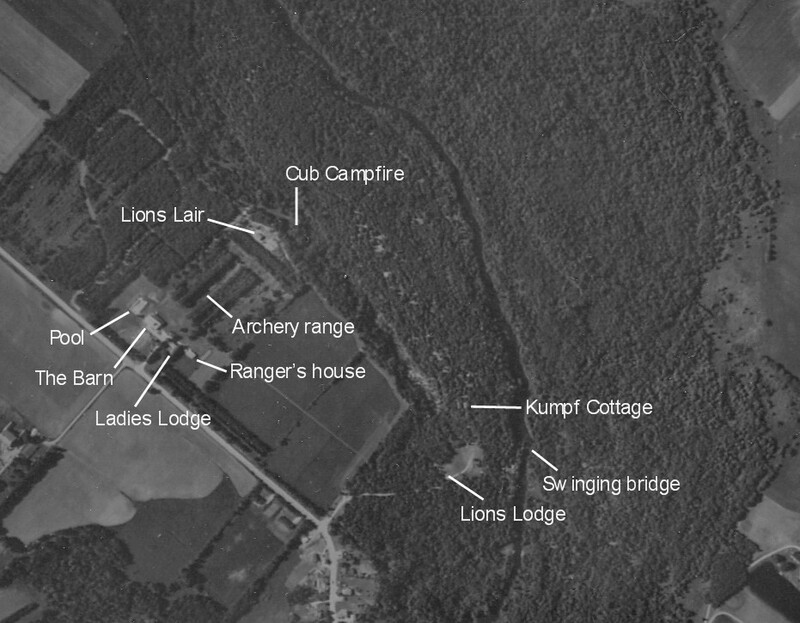 Here is a Google satellite view of Camp Everton. Camp Everton is filled with breath-taking scenery, cedar and mixed bush, small limestone caves and majestic cliffs. There are large open fields, dense bush, and a swamp. The beautiful Eramosa River flows through the 185 acres comprising the Camp. The camp has two formal campfire circles and an open air chapel. The camp has numerous camping sites, a large barn with full facilities, 6 cabins of varying capacities and facilities and 11 adirondacks. The camp may be used year round for Scouting events. Scouters are welcome to drop by any weekend. Our Campmaster or Camp Ranger will be glad to assist you. Camp Everton is about 50 minutes from K-W, just off Wellington Road 124, (formerly Hwy 24) north-east of Guelph. Here are text directions to Camp Everton. Here is a map to Camp Everton (8 Kb PDF). Visit our Policies and Fees page for important information. This is the water report for Wheeler Lodge for April 2005 — March 2006 (133 Kb PDF). Note: no drinking water — bring your own water. Contact the KW Scout Shop for booking the camp and picking up the key. Blue Springs is a provincial camping facility. It can be used year round for Scouting events. Blue Springs is about 55 minutes from K-W, just off highway 7, east of Guelph. It is 8 km south of Camp Everton. Here is a map to Blue Springs (8 Kb PDF). Please visit the Government of Ontario's website for West Nile Virus information.